Two months down, fellow readers! Is your TBR pile getting smaller yet? I’m working on two ebooks this month as well: A Night To Surrender by Tessa Dare (the first of her Spindle Cove series) and, from my TBR library list, The Proposal by Mary Balogh (the first in her Survivors Club series). Tessa Dare has quickly become one of my go-to authors when I want a fun, well-written Regency, and Mary Balogh has been one of my favorites for years. Our weather here in Michigan has recently devolved back into snowy, sloppy winter, too, so I suspect my free time the rest of the week will be spent with a fuzzy blanket and my Kindle. “All of London is abuzz over the imminent arrival of Wulfric Bedwyn, the reclusive, cold-as-ice Duke of Bewcastle, at the most glittering social event of the season. Some whisper of a tragic love affair. Others say he is so aloof and passionless that not even the greatest beauty could capture his attention. But on this dazzling afternoon, one woman did catch the duke’s eye—and she was the only female in the room who wasn’t even trying. Christine Derrick is intrigued by the handsome duke…all the more so when he invites her to become his mistress. This is one of my favorite books of all time! 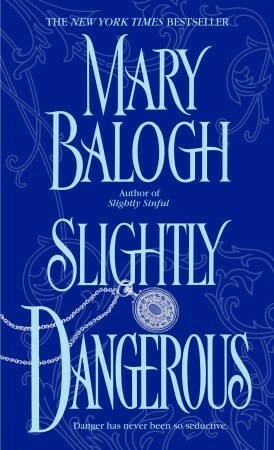 Like The Madness of Lord Ian Mackenzie, Slightly Dangerous at first appears to be like any other Regency romance. The beauty in this story, though, is its leading man, Wulfric Bedwyn. He is every inch the cold, formidable duke in public (and sometimes with his siblings). But throughout the previous five books, the reader gets tiny peeks at the man under all that ice. You see his loneliness and isolation, the way he adores his family even when he can’t (or won’t) tell them. You discover little pieces of his soul.